I replaced "stores" with "remembers" to make it clearer. Not true. The message is only displayed when you enter an old password. Any security system worth its salt (pun intended) is going to keep a history of old password hashes in order to prevent the user from re-using old passwords. This fairly standard security measure would be impossible without such a history. Google is simply making additional use of this history to the user's benefit. Nice. But how to restore account in case some hacker deletes it? Thank you for this information I appreciate it. Have you heard about Acai Berry Select? Its wonderful. can i know what was my first ever password using that? And yet, Google blocks you from reusing a password... maddening. I did not change the password for my gmail account, and I am pretty sure that it has been hacked by someone (the same email id and password I used for one more website, which is also not working). I tried all the ways to recover to the account, but failed. After providing the recovery email, or secondary email id which we provide for back up, it sent a password reset link to that account. After going through it, it resulted in creating a new gmail account instead of recovering the existing one. It would be really great if anyone can suggest me how to recover the gmail account, or address this issue. 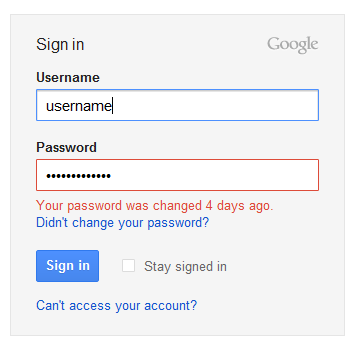 This is interesting, but how do you get google to remember your new password without having to retype it each time. my phone was stolen. when i got it bak it had too many pattern attempts. so it wanted me to login in with my google account. i know the email but forgot the password. now i changed the password on my email and it still wont let me in it. i need to find out the password i had first. Google gives two options for retrieving gmail password. first is using another Email and second is mobile number. if you lose your phone number then you can access verify another email. HELLO. this no longer works this way. Yet I need to determine just this very information. When i last changed my password. Does anyone know a current way to determine this information ??? sorry I want to see my gmail account all password . how it possible. how can i return old password for my gmail account after reset it , beacuse old password is saved on all my appliactions connecting with my gmial account and when i try to change password its refused it and tell me " Choose a password you haven't previously used with this account." how to find my old password after reset to new password in gmail? How to recover my gmail password that change by someone else and also change my recover phone number. Someone else is using my account, and changed my recovery phone number ... how can i recover my account ?? .I want to use the VERY FIRST PASSWORD I've used to reclaim and recover my account. I am trying to recover the password to my account I had since 2012. I know longer have access to that phone and need Goole to verify me.I also use the same address for my Facebook account. Feel free to share and get resolved an issue any time any where by letting our technical support team for yahoo mail to know that. short status for whatsapp with us and do not forget to share with friends.!!!!! Enjoy some digital india with us.